Mom, the Intern: My thoughts on The Boy Who Lived. My thoughts on The Boy Who Lived. Thank you all for indulging me and watching my dancing vlog! Be sure to enter the giveaway before Friday, July 29th. All you have to do is follow me, then leave a comment here. Leave additional comments (separate) for "liking" me on Facebook, following me on Twitter and sharing about the giveaway. You could win a $25 no-strings-attached Visa gift card! Dill and I are pretty die-hard when it comes to The Boy Who Lived. We have seen a few midnight premieres of the Harry Potter movies. The last one we went to was for The Order of the Phoenix, back in the summer of 2007. I was six months pregnant, beyond exhausted with a raging case of heartburn and I could not sit for long without becoming extremely uncomfortable. Needless to say, I didn't have much fun at that movie. Sorry, I didn't. Since then, we have always opted to see the movies the day after they come out. It's a lot easier on us tired old people with kids, and I find that we enjoy them more. Not that I don't love the thrill and excitement of midnight showings -- I was dying to get dressed up and go to Part II at midnight -- but I always end up regretting it a little. Instead, we re-watched Part I on Thursday night and then headed to the theater first thing Friday morning to see Part II. Dill took the whole day off of work just for Harry Potter (that's dedication right there). I was really, really impressed with the film. I find myself thinking about it a lot and there's not much I would change. I thought the director, producers and actors did J.K. Rowling proud. Yes, there were a few incongruities between the book and the movie, but it's inevitable in book-to-film adaptations. It's just the nature of the beast and I came to grips with that a long time ago. During the movie, I was in a constant state of flux between enchantment, disgust and pure astonishment (it was actually a bit exhausting, in a good way). I loved the little goblin tellers at Gringotts. I loved the decor at Shell Cottage. I loved the snippets of humor thrown in here and there. My favorite part, though, was when Harry explored Professor Snape's memories in the Pensieve. I was just grateful to have a whole pack of tissues in my purse -- it was terribly heart-wrenching and moving. So beautifully filmed and produced, too. That sequence made a really good movie epic. I also thought Helena Bonham Carter was GENIUS as Hermione-disguised-as-Bellatrix LeStrange. Any and all accolades of her acting skills, no matter how glowing, are an understatement. She was amazing as expected, but especially in those scenes. Every detail was right on. I thought the epilogue at the end was executed well, too. I was worried the kids would look like teenagers playing dress-up, but they didn't (though Malfoy's receding hair line was a bit strange, but the shot was brief enough not to be distracting). The children they chose to play Harry's and Ginny's were kids were spot-on, especially little Albus with his Bieber hair. Loved that. Since the movie debuted, I've been seeing lots of dialogue and musings on the web, asking, "Where were YOU when you first learned of Harry Potter?" So I guess I'll throw my two cents into the pail. I was 11 years old. I was at a friend's house for a sleepover. We swam and played around with her family for a few hours, and then it was time for bed. After we got our jammies on and settled into bed, my friend asked me if I had heard of Harry Potter -- no, I hadn't. It had just started to become popular in the States. She was reading the second book at the time and was obviously anxious to get back into it before going to sleep for the night. Wanting to get me hooked as well, she handed me the first book: Harry Potter and the Sorcerer's Stone. "You'll love it; you won't be able to put it down," she said. And she was right. I was immediately sucked into Rowling's carefully-crafted fantasy world of wizards, witches and magic. I couldn't turn the pages fast enough! The hours went by in a blink, and at some point I realized it was probably time to go to sleep. In that moment, I was officially a fan. For various reasons, I took a hiatus from Harry Potter after reading the first book. I got back into the series as a teenager. It didn't take long for me to get sucked back into the Harry Potter vortex. I plowed through books 2 - 4 in days. When I got all caught up, I couldn't WAIT for the next book to come out. 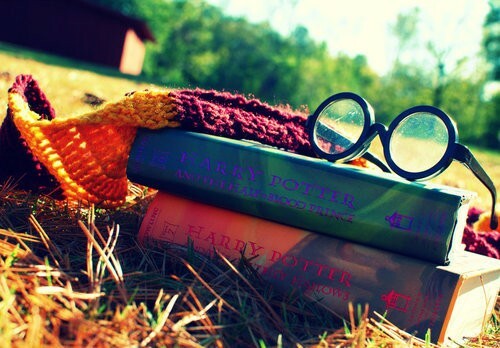 Harry Potter carried me through adolescence into adulthood. He was there when I was in junior high and high school, trying to figure out who I was and how I fit in with my peers. He was there when I met Dill and after we got married (I remember fondly picking up books 6 and 7 at midnight on their release dates with Dill). He was there when I was pregnant with my children and got me through the seemingly endless days of morning sickness. He was there when I was barricaded in my apartment, potty-training Bubby while hugely pregnant with Smush. Now I'm a mother of two and the Harry Potter saga is finally wrapped up. I never thought I'd see this day, but it's here, and it's a little sad. But, the series isn't really done. As I've gotten older, I've noticed different things when I reread the books. I see symbols I didn't notice the first (and second, and third) times. I find myself relating to the older characters. As a mother, different things tug at my heart. It's a series that grows old with you. Today, I had lunch with Mandy and we both agreed that the best books in the history of the world are the scriptures, followed by Harry Potter. Nothing even compares. Unfairly, I find myself comparing other book series, even really good ones (like The Hunger Games) to Harry Potter and being disappointed. I have put Harry Potter on a pedestal, but he deserves it. Not only is the series highly entertaining, but its message is clear: with loyal friends, inspiring mentors and enough gumption, you can accomplish anything. You can triumph over evil. You can change the world. I can't wait for the day when I can share the magic of Harry Potter with my children. I have no doubt they'll fall in love, too. These books are timeless classics that will brighten the lives of children, teens and adults for ages. J.K. Rowling, thank you for bringing magic to the Muggles. HAHA I LOVED the part where Helena Bonham Carter played Hermione-as-Bellatrix it was so spot on!! I thought that Ginny as a grown up wasn't too convincing. She just has a baby face that her hair-do didn't do much to change, IMO. I'm so glad they did the Snape memories sequence well because that is my absolute favorite part of the book and I definitely cried! i saw it friday morning too, and i was sad it was over. just makes me want to read them all and watch them all over again. and i agree...best series ever. Agreed! Wonderfully said! I love how you put Harry Potter right after Scripture. The first time I heard of Harry Potter was at church camp when they told us (as 8-9 year olds) not to read Harry Potter. At that point, I totally didn't care, but later on once I started to read it, I saw that it's still love and good trumping evil and hatred. I also loved the movie and thought Helena Bonham Carter did a fabulous job as Hermione and it is indeed prove just how brilliant of an actress she is. Agreed that the wander through Snape's memories was the best part. Honestly, I thought it was better than the book for that bit - it made a lot more sense to me than when I read it (though it's been 3 or so years since I have read it...). We loved the books thoroughly, and Ethan's read them all. Rachel is just getting started on them. You are making me so excited to watch the movie! I actually picked the first book up at the library at my elementary school before the second book had been released. It wasn't popular yet, just a random book on the shelf. I get to take credit for introducing my family and friends to the magic of Harry Potter. I think Alan Rickman is amazing. I love love love love love his characterisation of Snape. It is difficult to not empathise with him. It was beautiful. Great post! Even though I am only a fan of the movies and never read the books, the series is simply epic. HBC is a brilliant actress. I think her weirdness sometimes detracts from her exceptional talents! Just saw the movie and finally read your post! I agree with 100% of it. I LOVE HP soooo much. I have told Natalie practically the whole series (leaving out the scary parts) for bedtimes stories and we watched the first movie together. I cannot WAIT to read them aloud with my kids. Even Hannah can say, "Harry Potter." I also picked up HP and read it without having heard of it before. Katie had checked it out from the library and I was bored and asked her if she had anything to read. She handed me HP1 and said, "this one is good." And I was instantly hooked. The movie was amazingly fantastic. My only qualm is that I wished Harry had killed V more like in the book, in front of everyone and in the great hall. But other than that, I really liked the parts that were different. I was glad for them cuz it kept me guessing instead of always knowing what was coming up. I also was relieved to see that the actors really did look older in that last scene. Sigh. I wish there were more HP to come. Sad it's over but I enjoyed the ride. And like you said, it can be enjoyed for years to come.